Feldco Windows, Siding and Doors donated windows, doors and a garage door to a home being built just down the street from their headquarters. Employees also volunteered to help build the home. We pride ourselves on not only delighting our customers, but also giving back to the communities in which we serve. 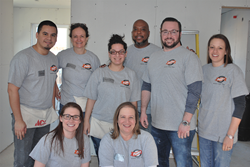 Feldco, the Midwest’s leading replacement windows, siding and doors provider, partnered with Habitat for Humanity of Northern Fox Valley and the Spring of Life Partnership on a Des Plaines, IL home building project. Over 6,000 volunteer hours were put into the home over the past ten months. The Spring of Life Partnership is committed to building homes for qualified families through volunteer support. This partnership has helped 15 families become homeowners since 1997. Habitat for Humanity of Northern Fox Valley brings volunteers and communities together to help people build or improve homes for families. “What’s great is having the homeowners right there alongside our volunteers,” stated Bill Klaves, Associate Director of Habitat for Humanity Northern Fox Valley. “Our slogan is ‘Building strength, stability, self-reliance and shelter’ and we were able to do this project as a result of the generous donation from Feldco and our other donors” he added. Feldco, a Des Plaines based company, not only provided the windows, entry doors and garage door for the home just down the street from their headquarters, but also had a team of employees spend a day helping build the house itself. Patti Freko, Feldco’s Vice President of Marketing, was one of those volunteers. “We pride ourselves on not only delighting our customers, but also giving back to the communities in which we serve. It was an honor to partner with Habitat of Northern Fox Valley, Spring of Life and the other generous donors to help get this house built,” stated Freko. Upon completion of the home’s construction, Spring of Life and Habitat hosted a celebration and house blessing to welcome the family to their new home. They were greeted with house-warming gifts, including some handmade quilts for every member of the family. Volunteers from the communities and partnering organizations were in attendance and were able to meet the new homeowner and welcome the family home. Feldco is the Midwest’s leading window, siding and door replacement specialist. Founded in 1976, the company is focused on delighting customers by making home improvement projects simple. With premium products, factory-direct pricing and certified installers, Feldco provides an excellent overall value and experience having served over 350,000 customers across Illinois, Indiana, Wisconsin and Iowa. Feldco has been frequently named one of Chicago’s Tribune’s Top Workplaces and was recently recognized as the #1 Window and Door Company in America by Window and Door Magazine. Please visit Feldco's website (http://www.4feldco.com) or contact the company's Communication Center (866-4FELDCO or 708-437-4000) to learn more about Feldco's products and services.